Though smartphones have become an integral part our life, sometimes using them too much may be unhealthy for you socially and physically. At Google's annual developer conference I/O 2018, a major feature announced for Android P dealt with tackling the problem of excessive smartphone usage. Google has called this collection of features in Android P as 'Digital Wellbeing'. Sameer Samat discussed these features during Google's keynote. One of the biggest updates under 'Digital Wellbeing' is the Dashboard app, which will allow users to see exactly how long they have been using apps on the phone. What we are talking here is a summary of the users' daily smartphone habits which include most apps visited, average time spent on each app, how many times the user has unlocked the phone in a day and more. Using this data you can see if you have been responding to emails all day or watching YouTube videos for hours etc. To curb your usage, you can set time limits on your app usage and also configure notifications so that you know when your daily allotted time is running out. The 'Wind Down' feature is basically for users who tend to use their phone just before going to sleep. Basically everyone. Quite often you end up straining your eyes watching content in the low light. 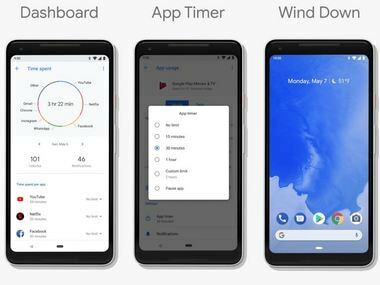 Android P's Wind Down feature will automatically switch the display to greyscale and so that it doesn't hurt your eyes and so that you can put your phone down quickly to get a sound sleep. The 'Do Not Disturb' feature sees some new upgrades so that it can block not only notifications and alerts but also visual interruptions that pop up on your screen. Also, users can just flip their phone to put it in DND and this feature has been aptly called 'Shush'. Eventually, (and we are talking about a long time) all phones that have been launched recently and those that are yet to be launched, will have Android P. While what 'P' stands for is still shrouded in mystery, it is good to see Google actively engaging in trying to balance our smartphone interaction with our social life.